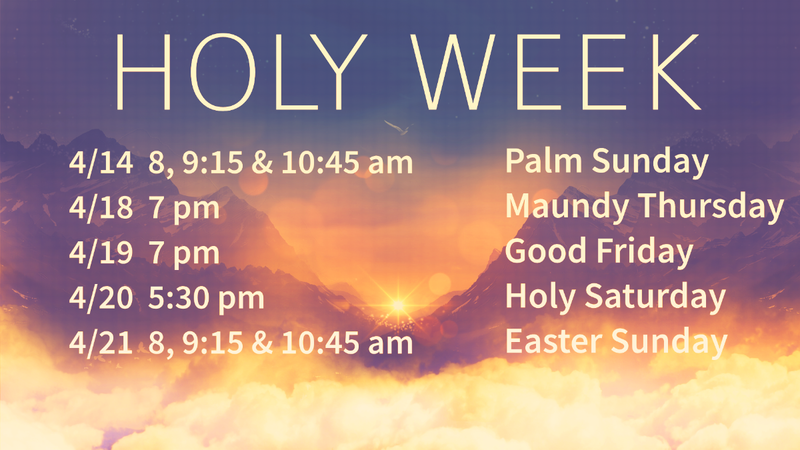 Join us as we prepare our hearts for Easter during our all-church Holy Week services at the Ridgeview Campus. Both Maundy Thursday and Good Friday, services will begin at 7pm with Holy Saturday Vigil beginning at 5:30pm. This year, in addition to our Ridgeview Campus Easter service times, Common Grace will have their Contemporary service at the Ball Conference Center at 10:45. We hope you will find one of our service times/locations convenient for you and your family to join us this Easter. NOTE: Children’s programming available at 9:15 Easter service. Nursery care is available at all services for children 5 and under. All students in 6th through 12th grades are invited to join us Wednesday nights at 6:30 pm and Sunday mornings at 9:15 am (3rd Floor youth rooms) for our new series Best for Last/Famous Last Words. We will discover the most important words Jesus shared with His followers while on Earth and look at how these words still impact us today! Wednesday nights include worship with our youth band. This week: Your failures don’t take away Jesus love. Saturday is the day! Now is the time to invite friends to this event and to church on Easter Sunday! 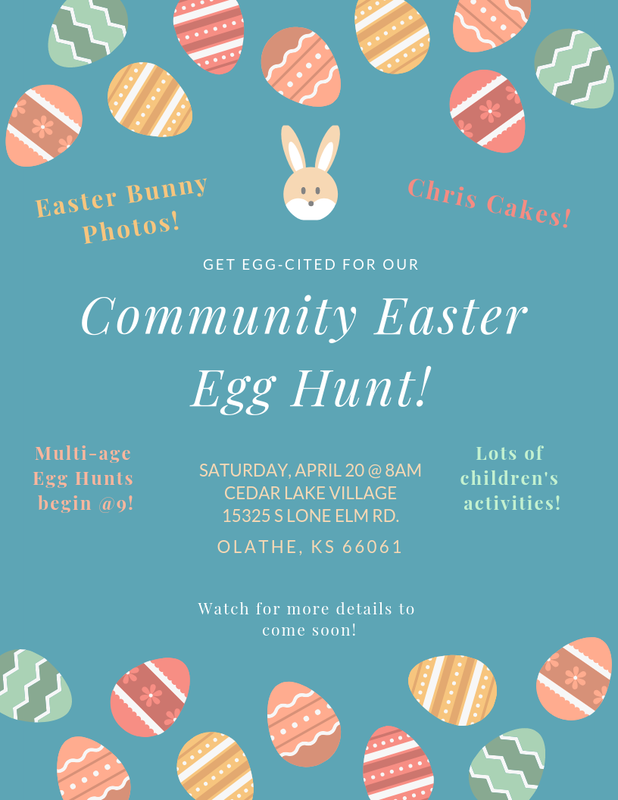 Our Easter Egg Hunt will be at Cedar Lake Village. Chris Cake pancakes will begin at 8am; age-specific egg hunts begin at 9am. Bring family or come and volunteer. Find information, RSVP, and share the event on Facebook! It’s so egg-citing! Gentlemen, mark your calendars now for open gym night at Center of Grace. Come join us this summer to shoot some hoops and play some basketball at the Center of Grace gym. This is for people of all skill levels and experience. Open gym nights will take place on the second Thursday of each month from 8:00-9:30 pm. There is no fee, but a free will donation to Center of Grace would be accepted and appreciated. At Grace, Center of Grace and Common Grace we are fortunate to have so many talented volunteers that share their many varied gifts with us. We are truly thankful for each person’s gift of their time and talents. We would like to celebrate these individuals together. If there is someone you would like to thank for sharing their gifts with us, write a note at one of the information desks and drop into the box. Then join us on May 5th between services to help us recognize the many giving hands of grace. Did you know that Grace UMC has an outdoor Labyrinth? Are you interested in being a part of a Labyrinth Care Group? Come to a Labyrinth Care meeting on Thursday, May 2nd at 7:00pm in the Coffee Shop to explore how we can rehab, care, and promote it’s use by the church and community. Contact Pastor Cheryl with questions.